The Hawaii Visitors and Convention Bureau held its 103rd annual luncheon yesterday, celebrating a record breaking year of the Hawaii tourism industry. 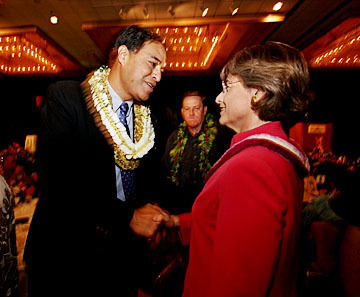 At the start, Honolulu Mayor Mufi Hannemann and Gov. Linda Lingle greeted each other. The state's visitor industry, which is celebrating a record-breaking year, needs to invest in marketing and facilities to continue thriving, officials said at the annual Hawaii Visitors and Convention Bureau luncheon yesterday. Industry leaders pledged to fine-tune their marketing efforts to ensure that the state can grow its No. 1 industry by attracting higher spending visitors, while Gov. Linda Lingle pledged her support to improve Hawaii's airports, harbors and parks. There has been a renaissance of investment in Waikiki, Ko Olina and the neighbor islands, Lingle said. The state needs to join the efforts to improve its community for residents and tourists alike, she said. "Spending money to have good beach access and to clean up bathrooms in state parks are things that we should do for our own people and if we do, our visitors will like it as well," she said. It's critical that the visitor industry embrace the Hawaiian host culture and address problems with facilities, said John Monahan, the HVCB's president and chief executive officer. "If we do not move now to invest in our top industry and to address the problems facing its future prosperity, we put it at risk," Monahan said. Looking ahead to next year, Monahan said the visitor industry will continue to see growth in travel from North America, but at a slightly slower pace than it has enjoyed this year. Year-to-date through September, visitor arrivals have increased 7.8 percent from markets in the U.S. West, 6.1 percent from the U.S. East and 9.7 percent from Canada compared to the same period last year, he said. "The state has reached the point in its visitor industry development that it is imperative that we market to the right visitors and not just any visitor," Monahan said. "I'm referring to the higher-spending, longer-staying, activity-oriented visitors that are our best customers." Karen Hughes, upcoming chairwoman of the HVCB's board, said industry leaders need to realize that they are enjoying the "good old days" now and plan for inevitable future slowdowns. "A couple of years ago, just the thought of surpassing 7 million visitors would have been cause for wild celebration -- or perhaps mental examination," she said. "From my perspective, congratulations to everyone for a job well done and let's celebrate. But let's also assume that the good times are not going to last forever and let's plan for it." In other business, the HVCB presented its highest honor, the Maile Award, to the Hawaii International Film Festival, the Sheraton Princess Kaiulani hotel and all the county governments. The HVCB also presented Mahalo Awards to the three influential supporters of Hawaii's tourism industry: Peter Schall, who ran the Hilton Hawaiian Village from 1986 until his retirement this summer; Walter Dods, the former head of First Hawaiian Bank who shared his business and marketing expertise with the industry; and Margy Parker, who retired in July after serving 23 years as executive director of the Poipu Beach Resort Association.